Exclusive Shoe Style : Events are hosted by an individual in which she invites her selected guests to attend. These events are typically held at the individual’s home, private party or selected venue. Shoe Style Events: Large scale events hosted by Shooey’s and opened to all individuals who are interested in quality, fashionable items and people. Subscribe for upcoming events & specials! 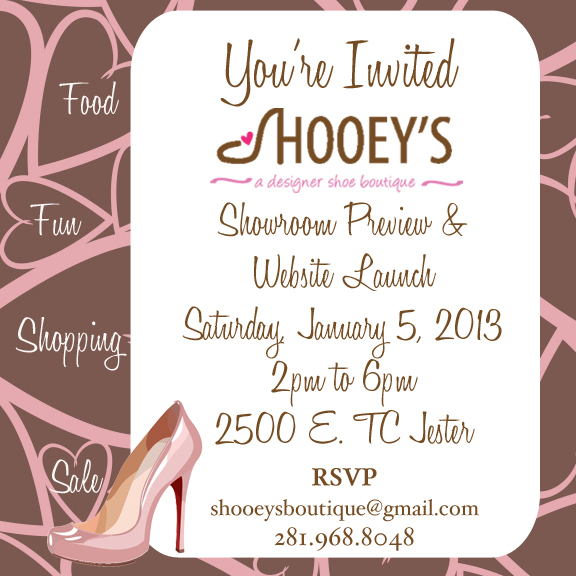 Shooey's Showroom Preview & Website Launch Event!! Shooey's Boutique was a vendor at this event. The conference provided an atmosphere for women to connect with each other and an opportunity for spiritual growth. There were three dynamic speakers, who spoke on the topics: Legacy of Faith, Healing for the Broken Hearted, and Power of Relationships. The Stiletto Stampede is a non-profit organization and their mission is to raise breast cancer awareness among young women and men and empower them to become advocates for their health. One of their events is the Stiletto Stampede, a 100 yard dash in heels! The Shooey's Boutique Team was proud to participate in the Stiletto Stampede in Houston and raise money for breast cancer awareness for the 2nd year in a row. Shecky’s believes girlfriends are a source of strength, nurture and inspiration that women should always appreciate. That’s why they've made it their mission to create social experiences that empower and reward women to discover and socialize with their girlfriends. Shooey's Boutique was honored to participate as a vendor in this awesome Girls Night Out event! You can catch Shooey's Boutique "popping up" around town at some of Houston's Fabulous Events bringing our merchandise to a variety of customers at eclectic venues.